As the year draws to an end I like to reflect on all that has happened. Every year we see trends come and go. Some are wonderful and others are just bizzare. 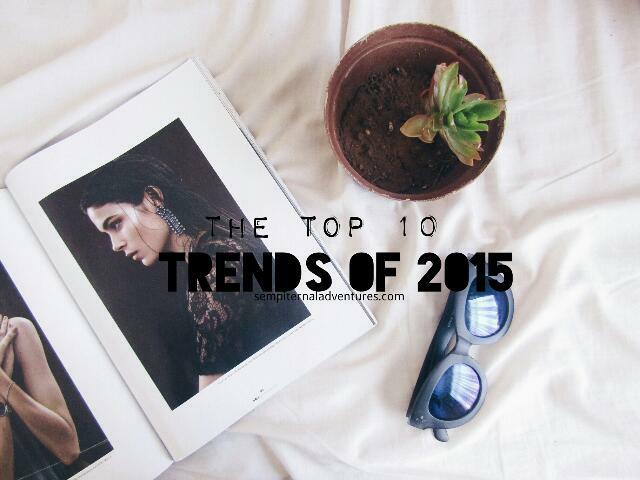 Below I have put together some trends that caught my eye in 2015. I started seeing these sometime last year and they have only gained popularity since then. I also got myself a couple and I absolutely love them. They are the perfect accessory for most outfits and they come in such a wide variety. You can find simple ones to lovely entricate designs. There are so many pendants to choose from, I once saw one with a Mockingjay and I still regret not buying it. There is something just so elegant about these it's no surprise that they were a favourite this year. I do however, think I saw too much of them. I think it's getting a bit cliché but that's just me. If it works for you, keep doing it! From the runway to the streets suede has been taking over. I'm not usually a fan of suede but I've surprised myself by featuring it in some of my wishlists. There is something lovely to it. It adds a different element to usual items and makes them feel a bit more bohemian. These made a huge comeback this year but I'm still not sure how I feel about them. At times I think they look absolutely wonderful and at other times I don't think they work at all. Someone once asked me how I would style them, I didn't have an answer but now I can tell you that they look awesome with a simple summer dress! These skirts have definitely taken over and are yet another trend I couldn't resist. I just added two of these to my closet. These went from the usual denim to black and thrn to suede which I absolutely adore! I honestly think a button down skirt is must have! If you are looking for the perfect accessory to wear to the beach look no further. Flash tattoos are beautiful and they come in so many lovely prints which you can wear around your arm, wrist, ankle and even on your forehead! It's all about giving it a personal twist. They can also be worn together with jewellery to create a lovely futuristic yet beautiful look. The ultimate staple for winter. They possess such elegance and beauty, I don't think they will ever be out of style. Pair them with an oversized sweater and you have got yourself a winning combination *heart eyes emoji*. Stan Smiths and Superstars, you have probably heard of them. The sporty luxe trend was quite big this year and I have seen people such as Amanda Steele and Maddi Bragg work it so well. It's all about balancing between something casual and something sporty. Adidas sneakers definitely add that element. Doesn't everything look so much better when it's matte? I love all shades of lipstick with a matte finish. Black, red, burgundy they all look gorgeous and I think we'll be seeing a lot more of these in the coming year. What are some trends that you have spotted this year? Love love love this post - I didn't even remember some of these being a thing this year but you are so right! love these and matte lips are my favourite! Matte lips are always a winner! You can't love everything right haha. Matte lipstick is the best! What a fab post! I'm loving matte lips and button down skirts at the moment! Nice post! Some of this things I will keep loving this year.